2. Visit and register your claim here and finally submit your invoice as proof of purchase. When your claim is verified, the amount will be paid directly into your account by electronic funds transfer (EFT). Claims must be received no later than 5pm AEST 14th May 2019. Claims received past this time will not be eligible. 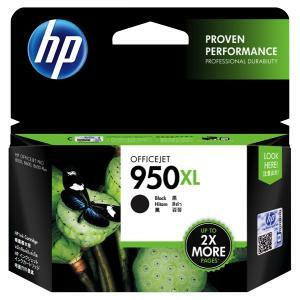 The HP 950XL Black Ink Cartridge - CN045AA has a printing life of up to 2,300 pages at 5% coverage and is compatible with the HP Officejet Pro 251dw, 276dw MFP, 8100 ePrinter, 8100 ePrinter N811a, 8600 N911a, 8600 Plus N911g, 8600 Premium N911n, 8610, 8615, 8616, 8620, 8630.